Lewis Hamilton says the pressure of this year's Formula 1 title fight with Sebastian Vettel is greater than he has ever experienced before. The Mercedes driver is 17 points clear of Vettel after Sunday's win in Germany but expects Ferrari to have the upper hand at this weekend's race in Hungary. Hamilton said: "The pressures are huge. The demands and the desires of myself and Sebastian are higher than ever. "The pressure is higher than ever. I am not fazed by it. I am excited by it." Vettel crashed out of the lead in Germany in the difficult late stages of the race when it was raining and the drivers were using slick tyres. 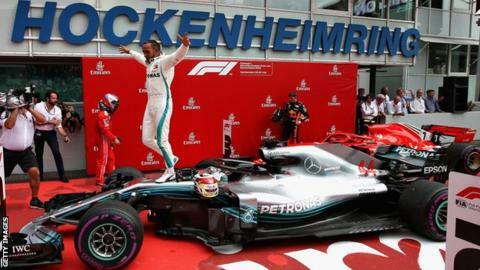 Hamilton, who said his drive to victory from 14th on the grid was one of the greatest of his career, said: "I do take a lot of pride in being a perfectionist and not making mistakes. With the pressure we are under, I really work hard to position myself mentally and physically that I am the last to crack. It is not easy but I am happy with where it is right now." He added: "Last year, I'm sure we reached just as high heights in terms of pressure at some point. It is just that this year it is even closer than last year so the smallest mistakes are even more costly. So there is more pressure on that. "We are racing a team that are faster than us this year. Last year, we were quite balanced. There were some weekends, they were faster than us, some weekends we were faster than them. "This year it is swinging more in their direction, so we are having to over-deliver on weekends and try to pull out more on weekends when we are not quick enough so the pressure to extract every last millimetre is greater than ever if I want to be number one at the end." Hamilton said the psychological aspects of performing at his best throughout a 21-race season that lasts nine months were extreme. "You don't see us away from the track and that is the most demanding thing," he said. "Keeping your mind in the game from March to November, arriving every weekend 100%. "I can honestly say not every single weekend I have hit the nail on the head and been able to do that. "There are parts of my performance this year that are not perfect. Last year I was great in qualifying, this year it has been an area I am constantly trying to work on - starts were more consistent last year, there are always areas, there is always something." Vettel did not talk to the media on Thursday following the death of Sergio Marchionne on Wednesday, four days after he was replaced as president and chief executive officer of Ferrari after becoming ill from complications following shoulder surgery. Hamilton said he expected Ferrari and potentially Red Bull to be stronger than Mercedes this weekend. "This weekend is going to be the same challenges as every year," he said. "We've got the Red Bulls - it is not a power circuit and they are quite often close. Ferrari were quickest here last year. It is probably going to be the same this weekend, we are going to try our hardest to improve on that. "Maybe tomorrow we will get in the car and we will have great pace; the car will work really well here. This is a really tough track, very hot, the way the corners are laid out has not in the past been good for our car package. "Our car likes to be on a more open circuit, more high-speed, downforce-dependency corners. This is mostly medium- and low-speed, so it will be interesting." Red Bull, who have won three grands prix this year but have struggled for competitiveness in recent races, have identified this weekend as one of their best chances of another win as the circuit layout does not penalise the power deficit of their Renault engine as much as other tracks.